Ask fellow campers about "Jude Travel Park" and nearby attractions. Very small park with small sites. No cable but broadcast TV is available. Small pool and hot tub. The owner is a very nice lady, the husband not so much. He cares more about the 4 cats than the guests. There are other parks very close by. I will try another if ever in the area again. Not enough space to open your awning. We camped at Jude Travel Park in a Fifth Wheel. Spent 4 night here while in New Orleans. A clean well maintained park, with super friendly service. Shuttle service to French Quarter. Train yard directly behind with banging noises at night. Sites are a little tight but long enough. We camped at Jude Travel Park in a Motorhome. While in New Orleans you must go see the National WWII museum. It's a full day to see the whole thing, but worth it. Make you take it the Tom Hanks movie, it was fantastic. Loved our stay here and it's all due to the owners who live on site. Very accommodating and a lot of information that really helped us enjoy the city. They even have free self-guided walking tours of the Garden District and City Park area. The park itself is small and homey and very clean. We will definitely be back. We camped at Jude Travel Park in a Motorhome. 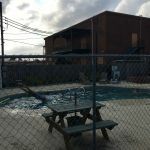 We stayed here for 3 nights while visiting New Orleans. It is a tight RV park. not a lot of room between RV's. The owners are great on getting you into your space. They offer shuttle service into the French Quarter for $10 round trip. The only drawback is the train switch yard at the rear and the 4 lane hwy in the front. Motorcycles race up and down it til late at night. They charge a service fee of $4 if using a credit card. We camped at Jude Travel Park in a Travel Trailer. Super friendly and helpful staff. The Park isn't that big but the available sites are wide and deep enough for me to park my 41 foot Class a. We camped at Jude Travel Park in a Motorhome. This park is basically in a train yard, in an urban area. Although there was a gate on the property we did not feel safe there. We heard trains hooking up and leaving the yard all night long. There were many full time residents there, who seemed to be questionable characters. The pool was so dirty that I wouldn't have bathed a dog in it. We had planned to stay here longer but left early to check into another RV park on the other side of New Orleans. We camped at Jude Travel Park in a Motorhome. 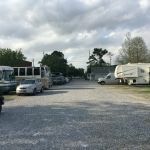 If you want to visit New Orleans, I would recommend that you check out the other RV parks besides this one. Stayed at this park becase of the good reviews. We were somewhat disappointed. Very tight sites. Staff was grumpy other than the check-in lady. Some train noise. Look to be in a bad neighborhood but felt safe in gated facility. Cats everywhere, owner has adopted some feral cats. Easy access to New Orleans. We camped at Jude Travel Park in a Motorhome. We stayed at Jude Travel Park at the end of November 2017. We planned to stay there 5 days but my wife broke her right shoulder while visiting New Orleans, November 30th and we had to come back home by emergency plane December 1th . The owners helped me as if I were one of their best friends, they helped me going back from the hospital even if it was late in the evening and to the hospital very soon in the morning. I had to leave my RV in the park two weeks and they charged me a minimal cost. 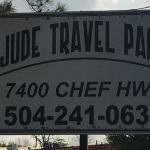 Jude Travel Park is best located to visit New Orleans. It is a very safe campground. The owners are the most helpful people we met in your 8 years RV experience and we will remember them forever. We camped at Jude Travel Park in a Motorhome. There is a food store nearby. Small very well maintained park. All back-ins and close, but if you are here to see Nola then this is the place to be. Great staff and they assist you getting parked making it easy. When I come back, it will definitely be here. We camped at Jude Travel Park in a Motorhome. If you need to see New Orleans, this RV place was right at the bus line to downtown. We wanted to see the WWII museum and it was worth it. This rv place is gated and you feel very secure. The owner is hands on and helpful. Sites are gravel and feature a picnic table. We camped at Jude Travel Park in a Motorhome. WWII museum is worth it! Rating is of course based on the location, being close to downtown and the French Quarter of New Orleans. The owner is incredibly helpful with advice and a modest fee for shuttle service. We also used Uber. As stated, sites are close together and the place is basically a safe parking lot for your RV. All utilities worked great and the other visitors seemed friendly. I would definitely recommend this place if you want to visit New Orleans. We camped at Jude Travel Park in a Motorhome. The park is located right off a main road and the entrance is clearly marked and has a wide entrance area. The check in process was very easy and the staff were very friendly and accommodating. We were escorted into our site and the hookups were in the normal places and we had no problem with the hookups. The park is essentially a parking lot that is used by many to park their rigs and then make there way to downtown New Orleans. We were fine with that as we were there just stopping off on our way to Houston for the Super Bowl. There is an inexpensive shuttle that dropped us off right by the French Quarter and we were able to get the same shuttle back. Overall a good park and we would definitely stay there again if we can ever make it back to New Orleans. We camped at Jude Travel Park in a Motorhome. and internet was fair. The people were nice and we stayed 3 nights. I am sure the location to Bourbon Street and attractions is why the sites are all very very close together. We camped at Jude Travel Park in a Travel Trailer. If you want a park close to town, friendly staff & reasonably priced, this is the perfect park. The owners go out of their way to give great service. While there is no pet run, there is ample places for your furry friend to walk n potty. We camped at Jude Travel Park in a Motorhome. We use the offered shuttle to town, by the owners @ $5 a person & used Uber home as the offered shuttle only goes till 9 pm. Our Uber cost approximately $11.00. A reasonable shuttle service to the French Quarter, and a deli about one door down that offers reasonably priced, delicious food. Best place to eat, The Pit BBQ. If you need a quick meal Natal's is within walking distance. The food is excellent and reasonably priced. They offer a shuttle to the French Quarter that is $5 per person each way. What can you say - you're in New Orleans!!!! They can book all your trips. Mardi Gras World was one of the highlights of the trip. It's free to roam around the warehouse, but the tour is well worth the price IMHO. Also, you need to call them to arrange for the free shuttle to pick you up. The parking lot there costs $10 even for a couple hours. Also, the little deli/convenience store, Natal's, two doors down from the RV park has pretty good food and a ton of it for a very affordable price. The shuttle service is great. They take you to a specific corner downtown and will pick you up at a specific time or you can call earlier if needed. A very nice touch. The French Quarter and ask the owner about a big park in town. We were too tired to do more than the French Quarter but we would take our dogs and drive to the Park if we were to go back to New Orleans. Apparently there is a lot to see there. National World War II Museum is a must! 4th ranked museum in the U.S, 11th ranked museum in the world. Easy drive to many plantations in the area, as well as the New Orleans Museum of Art. The owner met us on arrival and escorted to site - possibly very necessary to assist some to back into small tight sites and was happy for us to get settled and have lunch prior to making payment. This camp ground provides a perfect inexpensive option for RV travellers and we would definitely stay again if in the area. Lots to do in New Orleans. French Quarter is a must. Roads throughout area are in very bad repair especially bad around French Quarter. The park offers a limited shuttle to downtown $5 each way. Avoid the traffic and take the shuttle downtown. 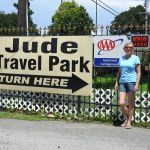 Are you affiliated with Jude Travel Park ?